What do you get when you cross two banking execs with a radiologist? Transparent balance sheets, perhaps? 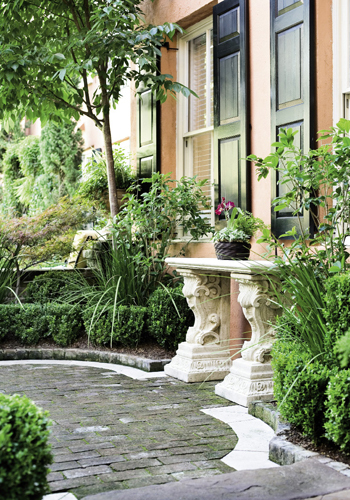 How about an elegant Charleston gardenscape, a growing investment grounded in excellent vision. 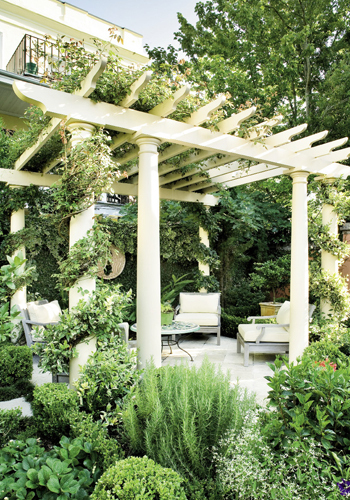 Well, that’s what resulted when former Bank of America colleagues Joel Smith and Carlos Evans with wives Kit and Lisa hired a retired physician with no formal garden-design training to overhaul the outdoor living area of their Society Street duplex. 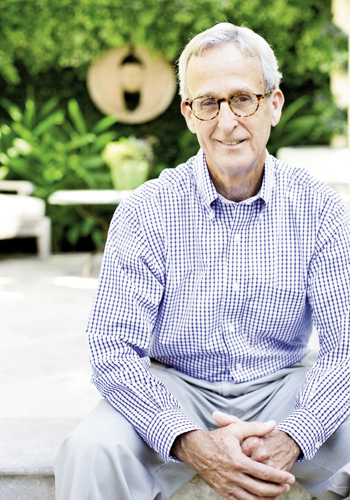 “When they asked me, I didn’t hesitate,” says doctor-turned-designer Gene Johnson, who was undaunted by the task despite the fact that he’d never designed a garden other than his own and was, admittedly, more a horticultural “putzer” than pro. But neither did the Smiths and Evanses hesitate. 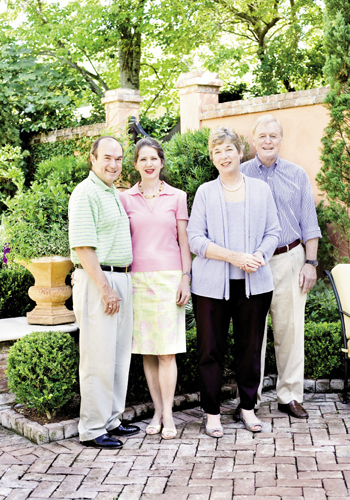 After years of being repeat guests at the B&B Johnson and his wife own on Montagu Street, the couples were well-acquainted with his grassroots talent. 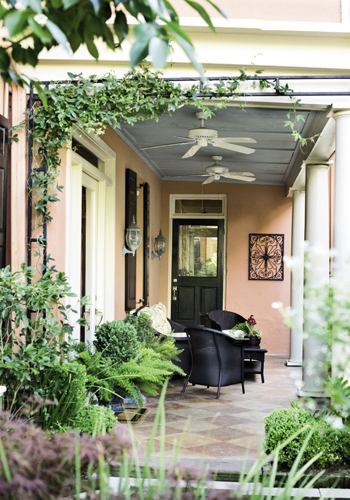 Each spring for the duration of the Spoleto Festival, the Smiths and Evanses would come from Columbia and Charlotte, respectively, to take up residence in the carriage house, a Gothic Revival jewel surrounded by a lovely formal garden created by Johnson. 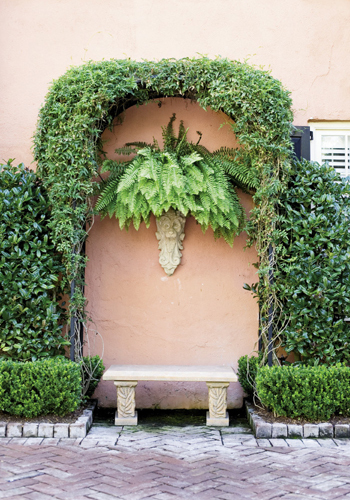 The boxwood and cypress wonderland was an orderly haven of serene green—a welcome respite from Spoleto’s lively performance and party scene. Over the years, the couples watched as both the garden, and the skills of its keeper, matured. 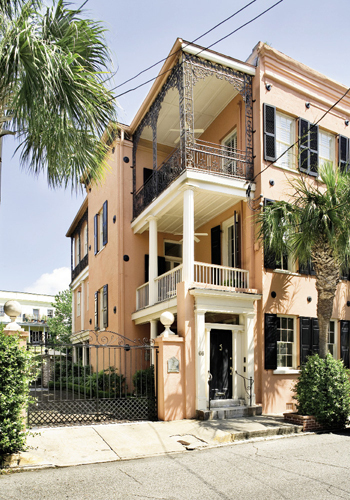 Enamored with Charleston—both the Smiths and Evanses lived here decades ago, and Joel and Carlos have been longtime festival board members, with Carlos currently serving as the board president—Joel and Carlos “developed a hobby of looking for property in Charleston,” says Kit. 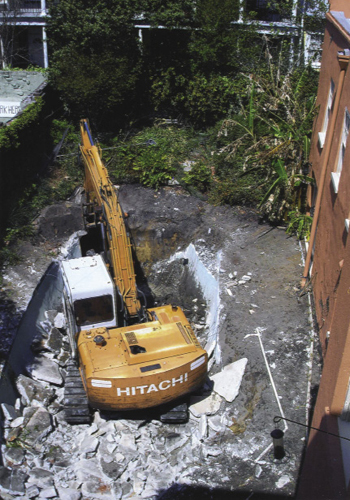 “We roamed around until we found this,” adds Joel, speaking of the circa-1839 single house just a block away from Spoleto headquarters. Given that the stately abode was already divided into separate residences, with a pool and small garden in the rear, the couples knew they’d found their pied-à-terre to share. “I’m very visual,” says Johnson in his soft-spoken, native-Charleston drawl. “I guess that comes from radiology. I look for symmetry; I like organizing space. 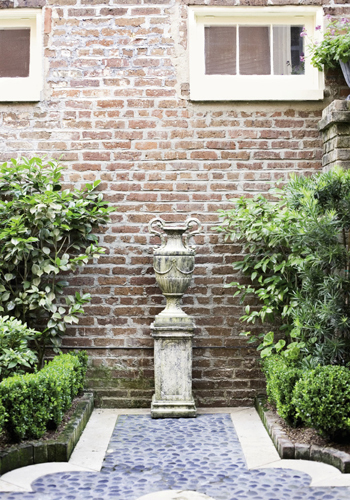 To me, a garden should make sense, more than anything.” For Johnson, this means creating a seamless flow and unfolding drama, so the garden invites fresh observation and a sense of discovery. 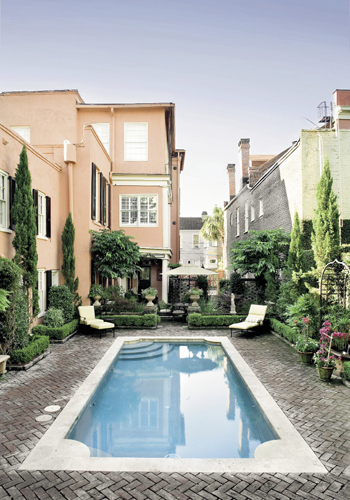 Old Savannah bricks were brought in for a geometric patterned driveway and a peekaboo wall with a custom iron gate (designed with a musical motif, a nod to the owners’ passion for the arts), and this space (sans autos) becomes the party floor for their festival soirées. 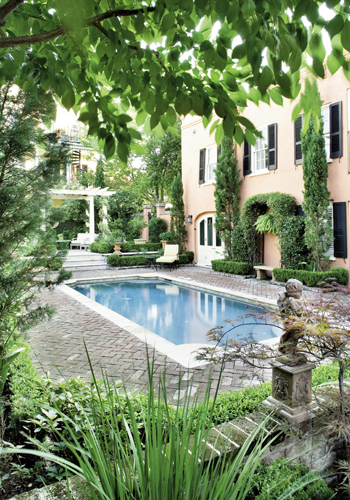 Tall cypress trees border the pool “room,” adding rhythm and height (echoing the piazza columns) and conveying the desired Italian flavor. 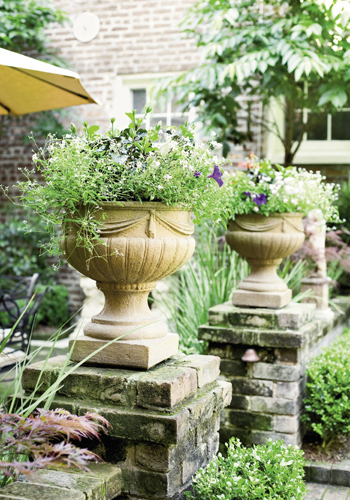 Manicured boxwoods, a Johnson signature, provide basic outline and structure, while ferns and annuals, azaleas and camellias give splashes of color and texture. 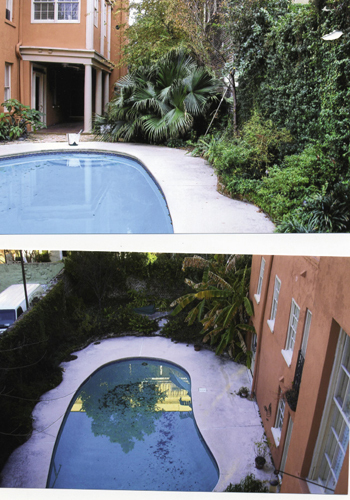 A subtle change in elevation when progressing from the pool area to the sitting area does more than delineate space. 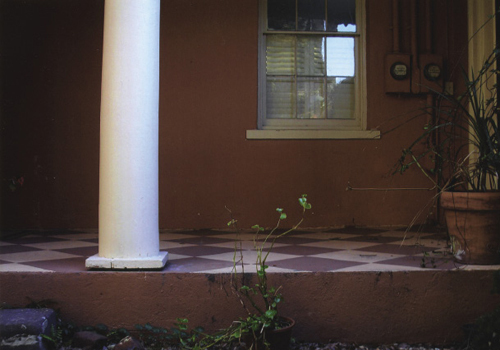 “I wanted the steps to slow you down enough to take in what’s around you,” Johnson explains.